? Phil Oligario built ‘Ninja’ with EXOCET main foil and rudder.
? Gearing and bias adjusters.
? Sovereign Combi trolly and trailer. Get some serious exercise in an International Moth. Contact: Rod Chadwick text 07474795164 home 02392 582887 ? 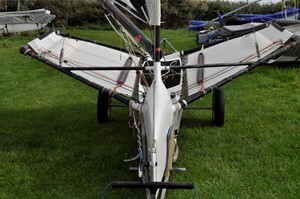 Phil Oligario built ‘Ninja’ with EXOCET main foil and rudder. ?	? Gearing .. Curently afloat (in Haslar Marina) whilst the trailer is in Hornet Sailing Club. Contact: Rod Chadwick text 07474795164 home 02392 582887. New Tohatsu 6HP Sail drive outboard (June .. This boat has had the same owner since new; great boat and well equipped. All enquiries to the owner John Stickland 01962 775213 Volvo Penta engine (13.43 kW), new batteries 2015, ..
Gentoo is a British registered Dutch Barge, 21m (70ft) x 4.5m converted into a modern motor vessel and houseboat. For more information or a viewing please contact Neil Laughton on .. Details below. If interested please contact: Hugh Botterill 07850 704491 For sale is our Hunter Delta 25, lifting keel variant. Professionally restored by previous owner to a very .. Bowman 36, long keeled sloop. A true “stop and look back” boat. This is a very rare example of the classic Holman and Pye design, which won the London Boat Show cruiser award in ..
Garage "Chandlery" Clearance Brand new, never used 2.8M Whip Aeriel for sale. Still in the original packing and not required so grab a bargain and make me an offer. It has to go! For ..
Lovely ladies RNSA Brooch by Benzie of Cowes looking for a new home.